A short drive from the Denver area, the Aurora Reservoir is an oasis out in the middle of nowhere. With soft sand and sparkling water, this reservoir can boast that its water and beach are the cleanest in the Denver area. Coastal transplants can grab the beach towels, bathing suits and picnic necessities and satisfy their beach withdrawals. There are no motorized boats allowed which makes it the ideal place to swim, fish and even scuba dive. 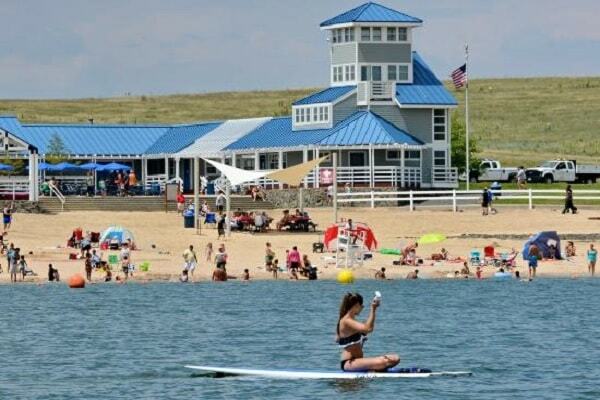 Never a shortage of activities, the Aurora Reservoir has an amazing eight-mile trail around the water which is perfect for walking, biking and roller blading. For those who want to work on their aim, Aurora Reservoir even has an archery range. Aurora Reservoir is often overlooked in favor of more dramatic Colorado beaches, probably because it’s more of a day trip destination than a camping ground. But it has over 800 acres of water surface, and has been named (by local publication Westword) as “The Best Park for Fishing.” Fishing tournaments are commonly hosted here. The Aurora Reservoir serves as drinking water storage for the city of Aurora. There’s plenty to do here, like hiking and boating, but swimming is only open during the summer, and all boats must be non-motorized.